23andMe, Pfizer, Inc. and the Lupus Research Institute are launching a collaborative study focused on the genetics of the autoimmune disease known as lupus. The aim is to quickly enroll 5,000 people with the disease, which affects about 1.5 million people in the United States alone. 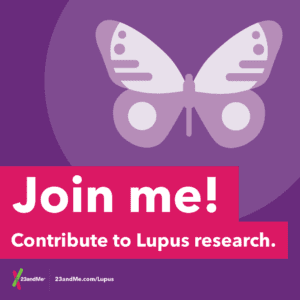 Recruitment for the study begins this month, which is also Lupus Awareness Month. The disease is characterized by the body’s immune system attacking normal, healthy tissues almost anywhere in the body. People with lupus might have symptoms that include inflammation of the joints, or skin rashes, sores or damage to the kidneys, or heart or lungs. While there is no cure for the disease and it isn’t very well understood, researchers know some factors linked to the disease. They know that there are both environmental and genetic factors involved, and hormones also play a role. The research to be lead by 23andMe will focus on genetic factors, but it will also incorporate data from participants’ medical records and look at how the disease progresses over time. The hope is that this research will uncover some of the genetic causes for lupus that could indicate onset of the disease, how it progresses and how patients respond differently to different treatments. For the lupus study, 23andMe will recruit new participants as well as conduct outreach to existing customers, who once determined eligible, will be required to provide consent to participate in this new project. Recruitment of eligible study participants is expected to be completed by mid 2016. For more information, including eligibility requirements for joining the study, please visit https://www.23andme.com/lupus/.